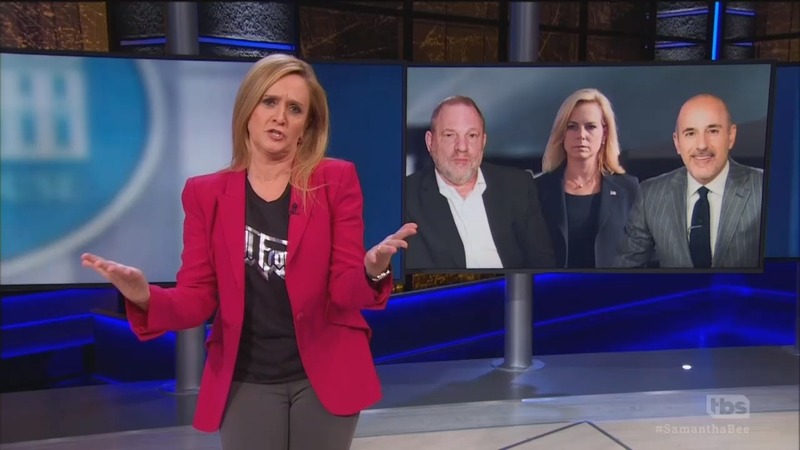 On her Full Frontal show on TBS, liberal comedian Samantha Bee began her Wednesday show by trashing former DHS Secretary Kirstjen Nielsen, calling her a “lying ghoul,” and “one of America’s greatest monsters,” and hinting that she is the Wicked Witch of the West. Bee also displayed Nielsen’s image next to those of sexual predators Harvey Weinstein and Matt Lauer, and suggested she should never be allowed to work again. Visible on screen was an image from The Wizard of Oz which showed the feet of the Wicked Witch of the East sticking out from underneath Dorothy’s house. A bit later, after noting reports that Nielsen is concerned about how she will be viewed because of her role in the handling of illegal immigration, the liberal host mockingly predicted that no one will confront Nielsen in public places because “you look like exactly every other white woman on the planet,” while showing on screen images of a number of other blonde white women who are public figures, including Bee herself. She went on to deride White House advisor Stephen Miller as “Secretary of Gargoyles” as she recounted that he was reportedly responsible for Nielsen’s firing. Bee concluded the segment by begging: “Whatever you do, do not give Kirstjen Nielsen another f—ing job,” before joking about all blonde women, including herself, looking alike.